There’s nothing that whispers “Venezia” quite as sweetly as a gondola ride. There’s an eerie magic to a glided tour through the watery back alleys of one of the world’s most romantic cities, especially in the fading light of day. We’ve been fortunate enough to indulge our senses with such an experience on two occasions. Both times we have purposely chosen to go at the twilight hour, mostly because by that time the cruise shippers are back on their respective boats and the city feels at rest. Also, the canals are less congested and a meander through the back passages of this ancient city becomes a peaceful walk in the park, as it were, instead of the hustle and bustle of colliding gondolas at mid day. The only challenge at that hour is photography. Around every corner a “Wow!” moment, made all the more dramatic by the dimming light, begs to be captured. But a moving gondola and a challenged light sensor make it almost impossible to capture the moment to any great effect. On my camera screen these images looked so clear and in focus I was thrilled. I could hardly wait to relive them on the computer screen at home. However, when I finally did get to shine a larger light on them I was so disappointed. They were blurry, and no matter how much I doctored them I couldn’t make things right. And then this challenge came along. 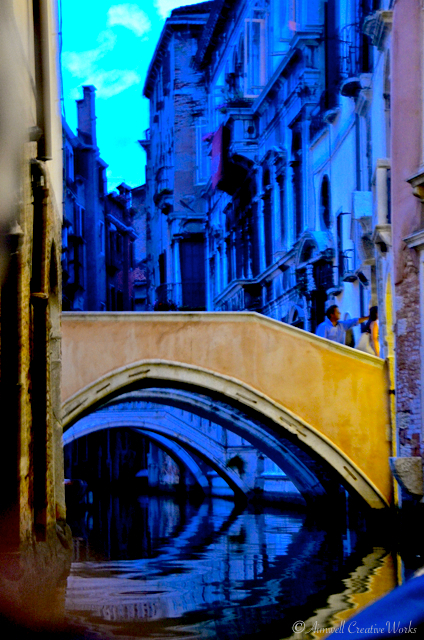 Take what you will from these two images captured on a glorious evening winding through the canals of Venezia. They’re blurry, to be sure, but perhaps that’s all part of the mood. At the very least these images remind me of a magical tour of the aquatic back alleys of a glorious ancient city, and how I would return to experience it again in a heart beat. But then, to be honest, the notion of returning to Italy is never very far from mind. 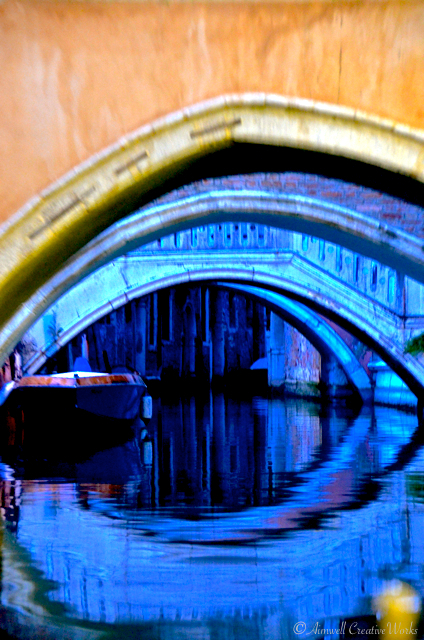 This entry was posted in Art, Daily Post, Italy, Photography, Travel, Weekly Photo Challenge and tagged Aimwell CreativeWorks, blurry, canals, Dorothy Chiotti, gondola, Italy, lagoon, Photography, postaday, twilight, Venice, water, Weekly Photo Challenge. Bookmark the permalink. Love the mood and colors, Dorothy. What a city. I had a similar experience lately with a photo I was certain would have been in focus, but when I got home, it wasn’t. A couple of days later, I used an app to make a faux ‘watercolour’ of it, to perfect advantage. Lovely ‘save’ on these images Dorothy! I think they work brilliantly with those vibrant colour blocks 🙂 Makes me think of a screen print or spray painted canvas! Thanks. I’ve grown rather partial to them. 😊 I wonder how they’d look hi-def and printed in large format. Oh I think they’d look amazing! !